The World Cancer Research Fund (WCRF) has completed a detailed review of more than 7,000 clinical studies covering links between diet and cancer.1 Bottom line: Processed meats are too dangerous for human consumption. Consumers should stop buying and eating all processed meat products for the rest of their lives. Processed meats include bacon, sausage, hot dogs, sandwich meat, packaged ham, pepperoni, salami and virtually all red meat used in frozen prepared meals. They are usually manufactured with a carcinogenic ingredient known as sodium nitrite.2 This is used as a color fixer by meat companies to turn packaged meats a bright red color so they look fresh. Unfortunately, sodium nitrite also results in the formation of cancer-causing nitrosamines in the human body. And this leads to a sharp increase in cancer risk for those who eat them. A 2005 University of Hawaii study found that processed meats increase the risk of pancreatic cancer by 67 percent.3 Another study revealed that every 50 grams of processed meat consumed daily increases the risk of colorectal cancer by 21 percent.4 These are alarming numbers. Note that these cancer risks do not come from eating fresh, non-processed meats. They only appear in people who regularly consume processed meat products containing sodium nitrite. 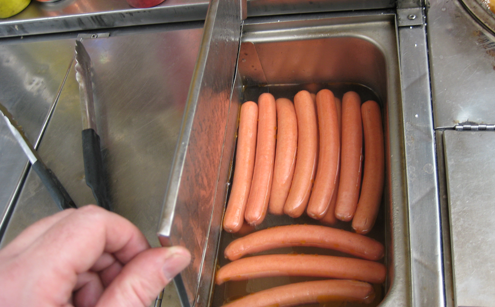 Don’t eat processed meats served by restaurants, schools, hospitals, hotels or other institutions.